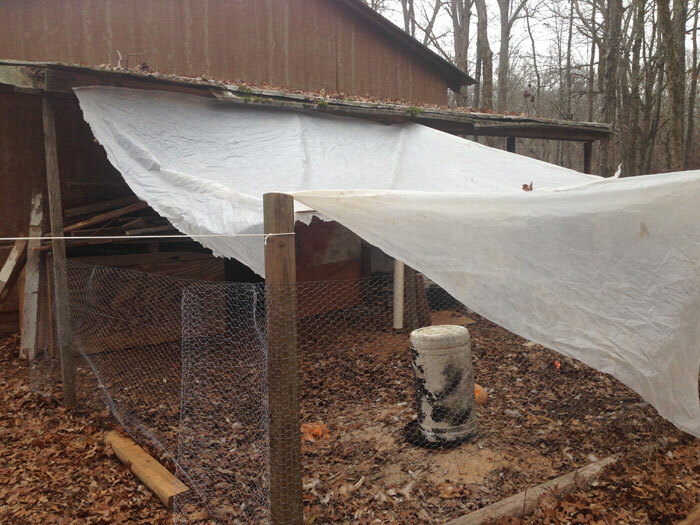 Coop d’etat: How to Build a Chicken Tractor. Sort of. My chicks were starting to not be chick-ish anymore, and were long overdue for a home renovation. And I know all about home renovations. 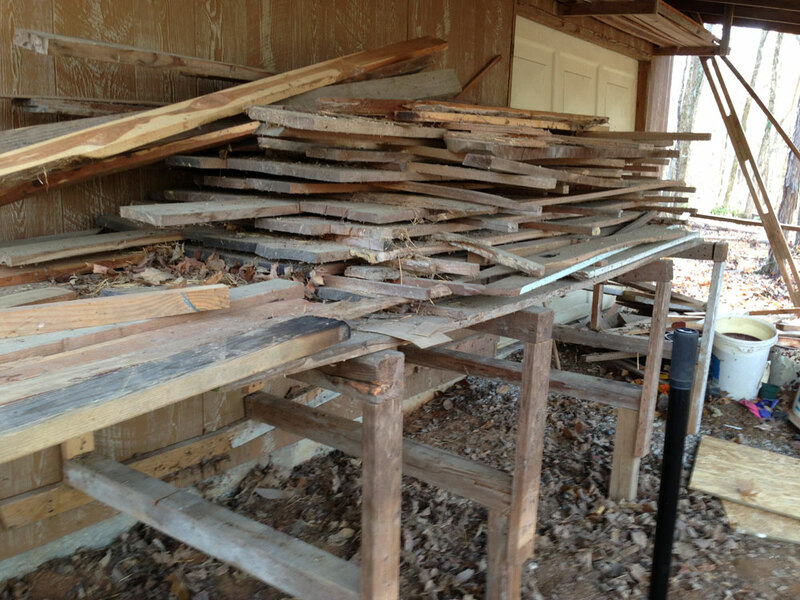 I have a good amount of scrap wood leftover from our house, but not a lot of good clean 2×4’s (or studs, as those of us in the know call them; my constant joke when trying to find a stud is to simply say “I’m right here.” Always a crowd pleaser, amiright? ), so I picked up a handful from Lowe’s. I also picked up some 2×3’s because I thought it would be more efficient to make the run out of those to keep it light. 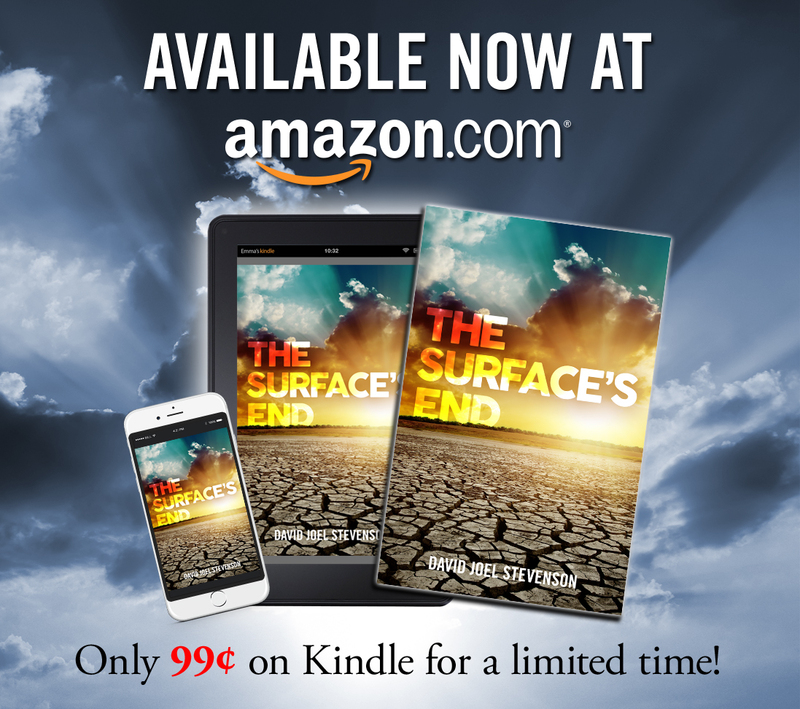 Looking back, I should have gotten only one or the other – not both. 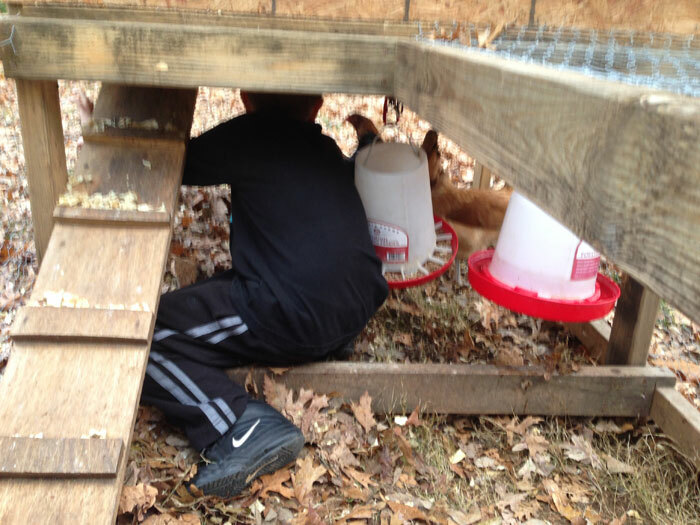 One thing I thought I knew for sure is that I needed 4 square feet per chicken in the coop, and 8 square feet per chicken in the run. (My brother informed me that I actually needed 10 sq ft in the run, but I was close!) 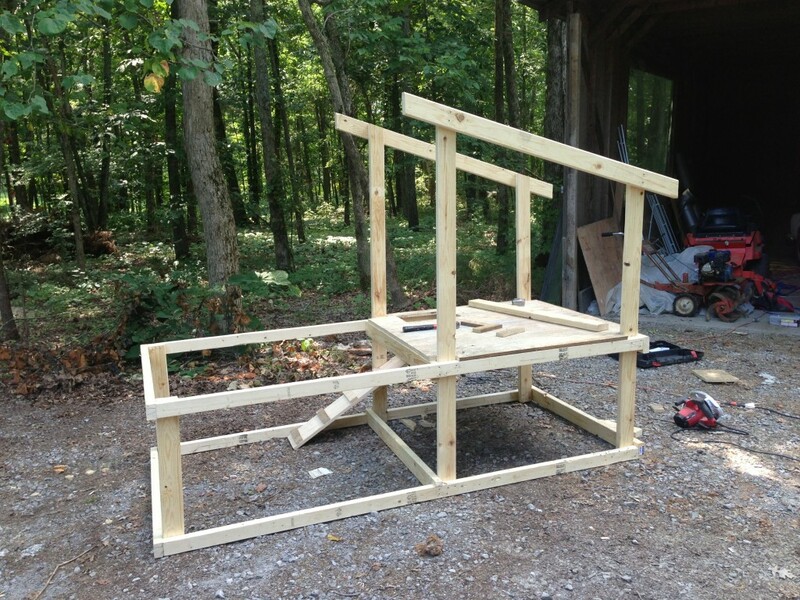 I decided to go a little tight on those numbers, though, because I want to build a stationary coop and run big enough for 20 or more feathered friends – so this is simply another step along the way. 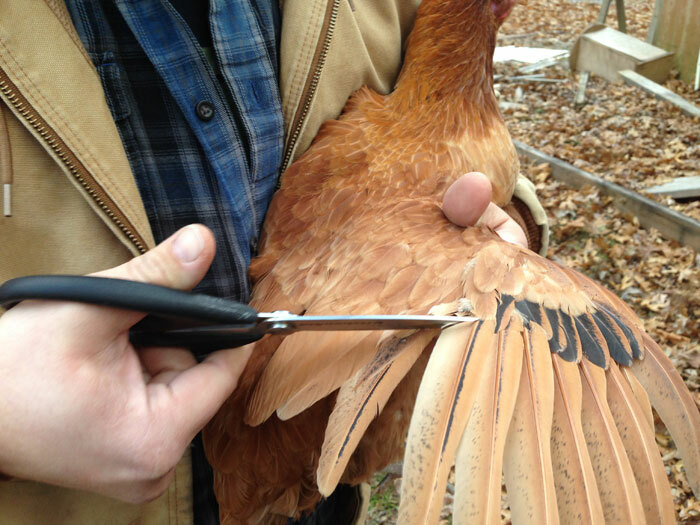 The main reason for keeping it tight is because since I was building a chicken tractor – meaning I would move it around as they eat everything in the patch of grass it contained – I didn’t want it to be huge and hard to move. It’s still pretty huge and hard to move even at its current measurements. 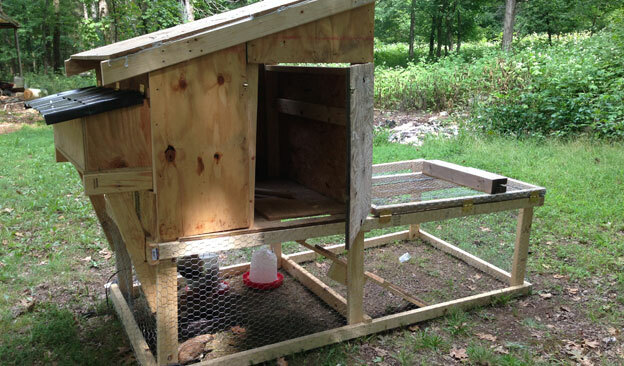 Probably not the right way to add a roof – but again, these are chickens, people. 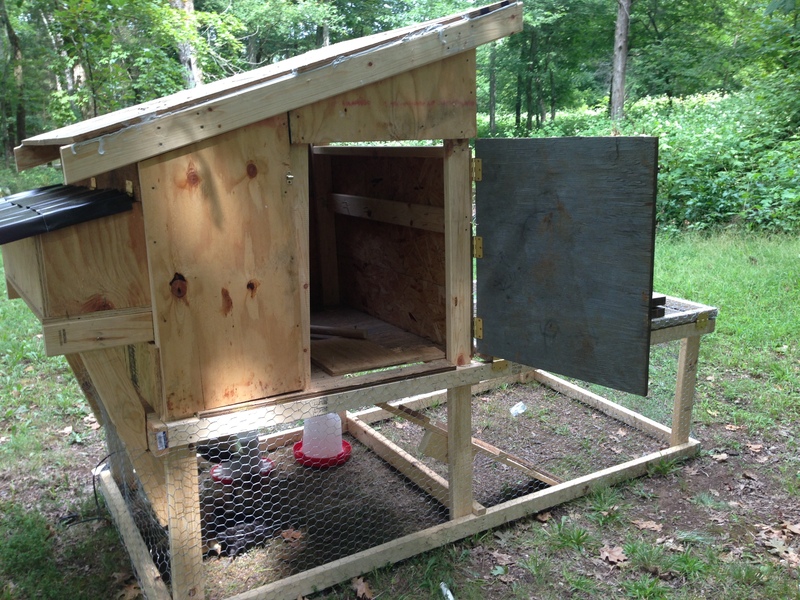 I decided on a run at 8’x4′, and a coop that would sit on top of half that – that way I could keep it fairly compact while not sacrificing the space on the ground. You might or might not be able to see the differences in the 2×4’s and 2×3’s, but I started getting nervous when I got to joints that were made with the two types of wood. It ended up being fine, but I had to finagle them a bit. 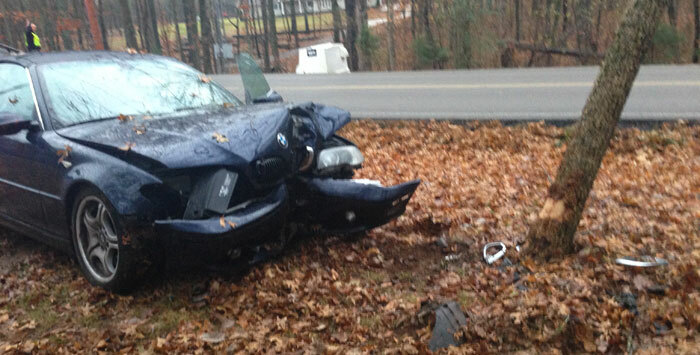 Hopefully you won’t see from the pictures that it’s definitely not squared up. Almost none of the angles. But I blame it on working on an uneven surface. And also on the fact of never checking to make sure my angles were square. Lesson learned. 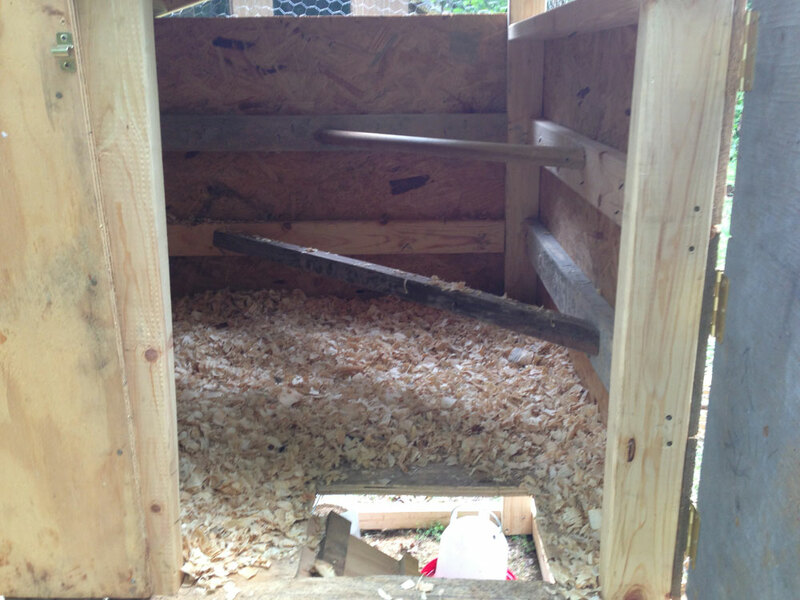 There’s a better picture of the ramp, which is braced by a couple 2×4’s nailed into the coop floor and the corner board. It’s mostly made from scrap, but they don’t seem to mind. I pretty quickly realized that even though I planned on having nesting boxes that were accessible from the outside, I hadn’t planned on it. 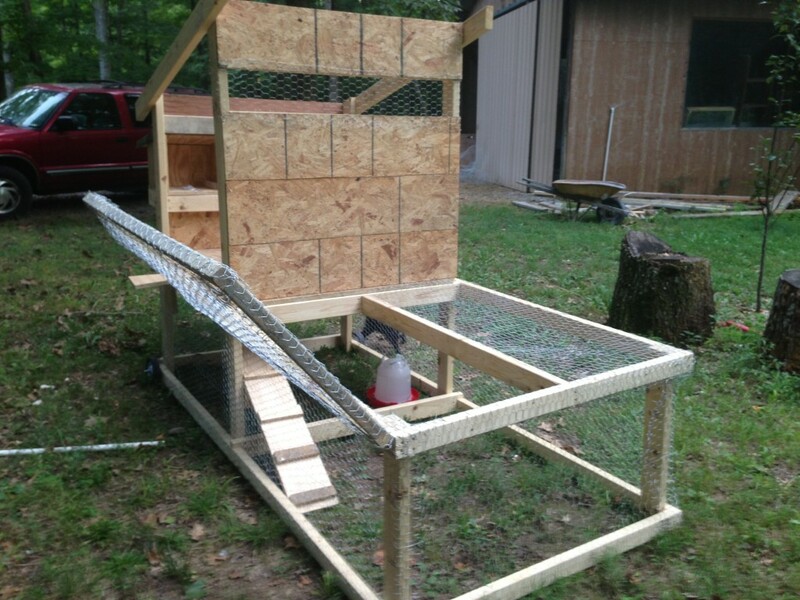 I had to add the braces because they were sagging pretty badly – and I figured that adding the weight of birds and eggs and bedding would not somehow lighten the load. I’m pretty proud of how it turned out, though, after calling my brother a couple times and doing some research on the interwebs. 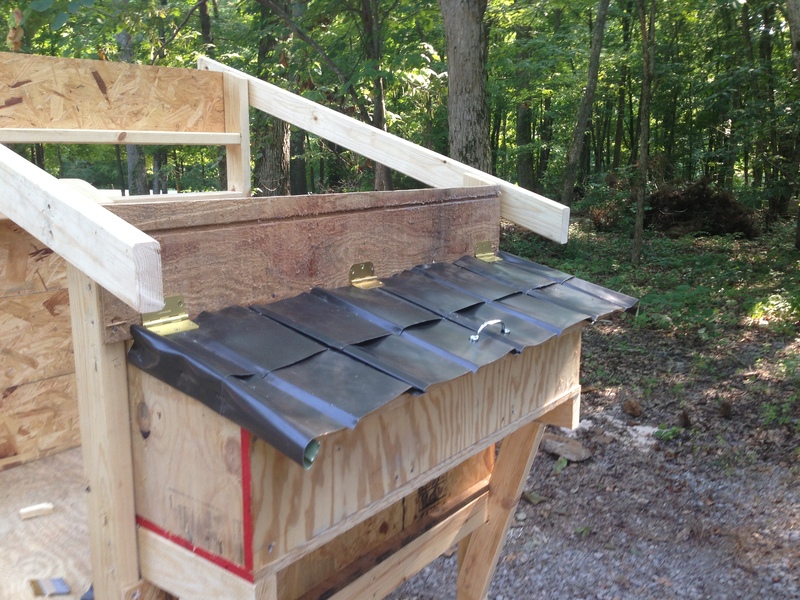 It’s really ugly and probably dangerous, but I have a lot of metal flashing leftover, and wanted to make sure my nesting boxes were super weatherproof. Just don’t touch the edges. 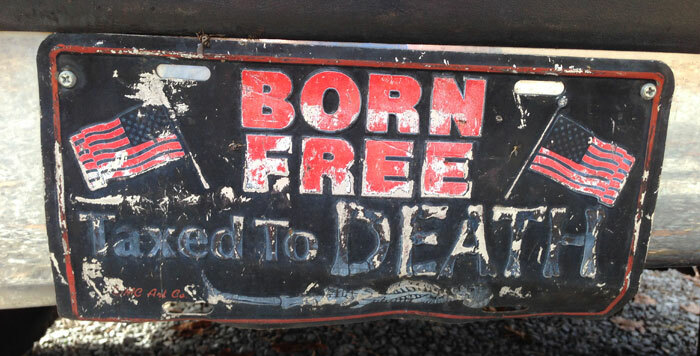 Or if you do, make sure your tetanus shot is up to date. It took a long time, because most of these pieces were cut off after they were formed together, so I had to pretty much unform the edges to form them again. And because I’d never done this before. 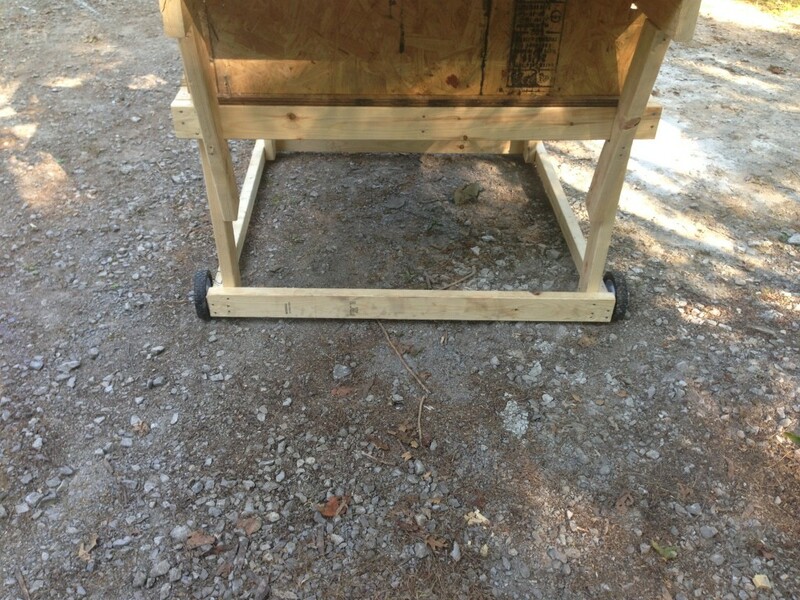 I added some 6 inch lawnmower wheels to be able to move it around. However (spoiler alert), I ended up replacing them with 7 inchers, because the smaller ones weren’t easy to work with on uneven ground. The larger ones lifted everything off the ground just enough to keep me moving, but not enough to worry about leaving enough space to let them shimmy out. 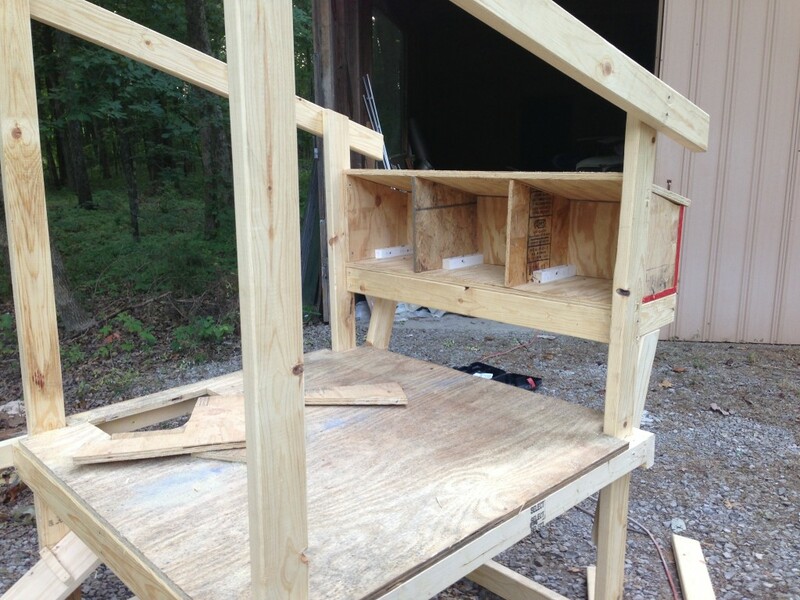 I just couldn’t let my birds sit in a cramped box when I basically had a finished run for them. 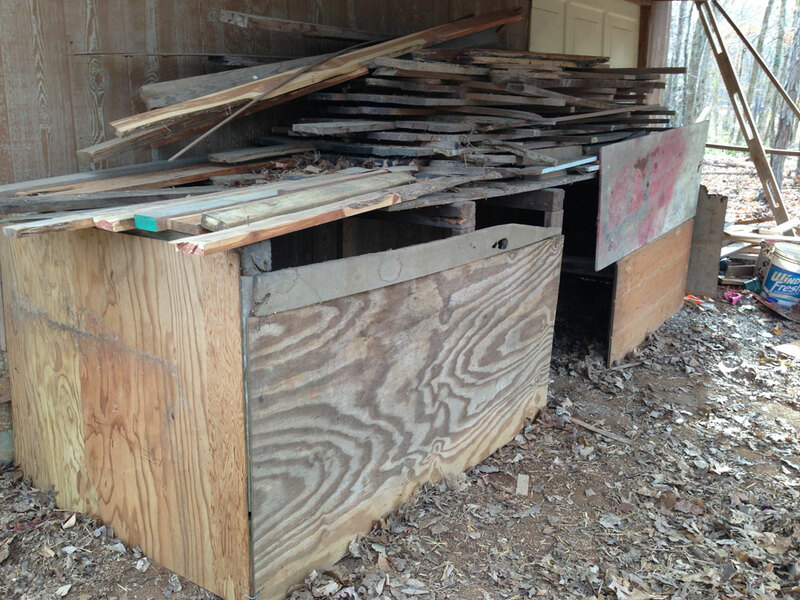 I screwed a piece of wood over the coop entrance and put them inside. After a time of obvious confusion (they had only ever seen a roof above them and sand/paper towel below them – never the sky nor grass), they were super excited to run around. As were my cats. I was nervous that the cats would get aggressive with them (one of my cats, while pregnant, chased down a squirrel and ate it), but they seemed to simply be curious. 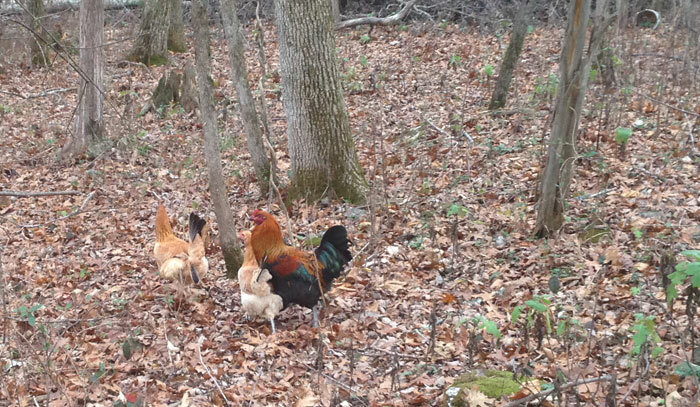 I kept my eyes on them for a while, but they apparently like to watch the fowls just as much as I do. Almost done! Added a door, walls, and a roof. I also added a few more 2×4’s to brace those things (but did it after I had much of the plywood on, so they’re not included in the ‘skeleton’ pictures. I sealed up the roof pretty well with caulk (the contractor’s version of duct tape), but later added some roofing paper to make sure and keep the leaks out. 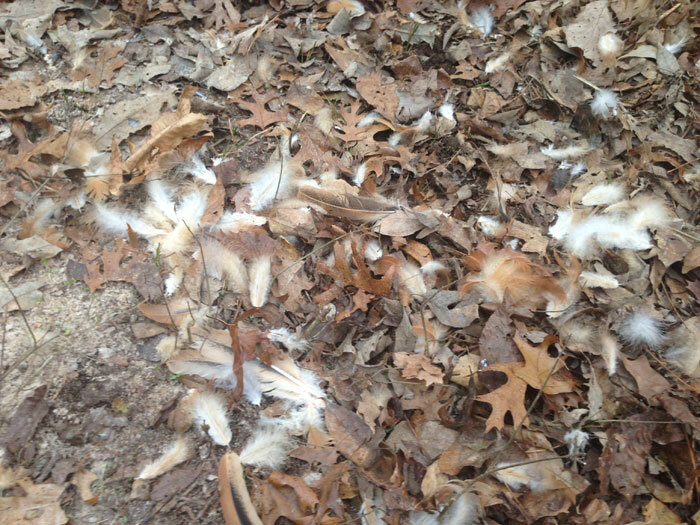 There’s another thing I forgot – roosts! It’s a chicken’s natural instinct to sleep off the ground to keep away form predators, so this was another thing that I was planning on, but didn’t include in my plans. 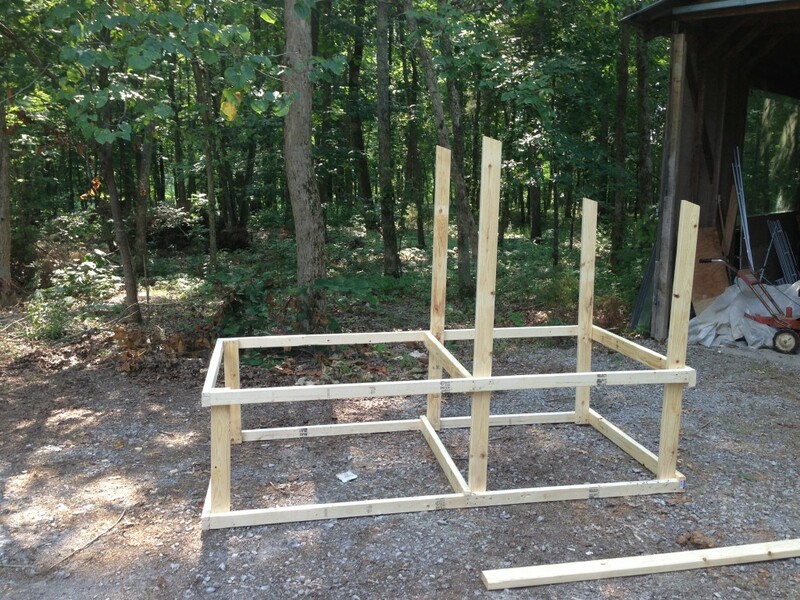 I ended up adding some more 2×4 braces – which is much more difficult when all of the walls are on. 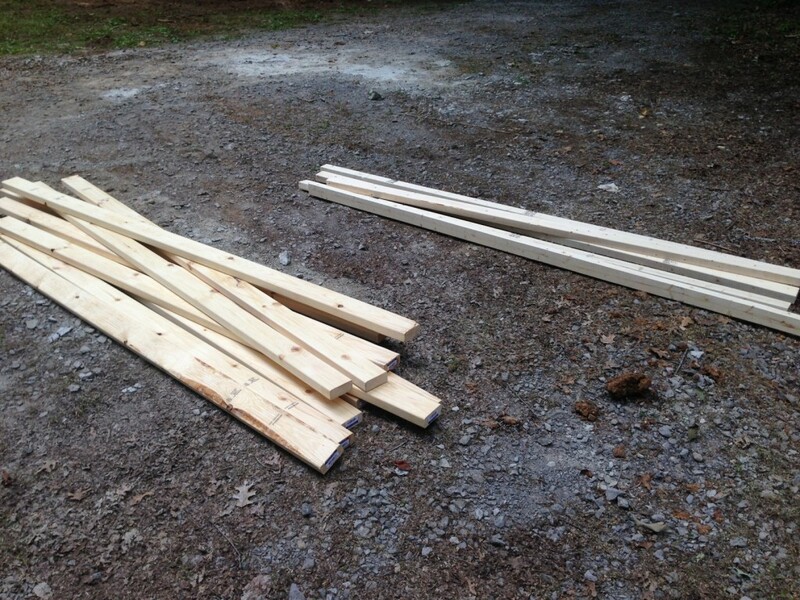 Then I just cut some 45° angles on some roost-ish wood I had and drove some awkward nails. I added some bedding, and voila! One by one, they started figuring out that their home had doubled in size. The first to find it (a rooster, I think) wanted to see just how high he could get. 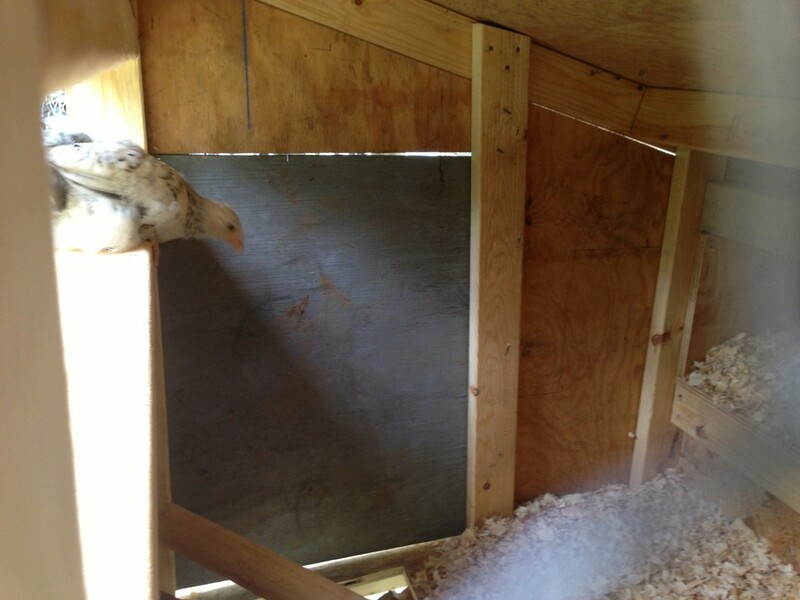 Luckily, as soon as he got to the highest point of the coop, he pooped. Thanks for the commentary on the craftsmanship, big guy. 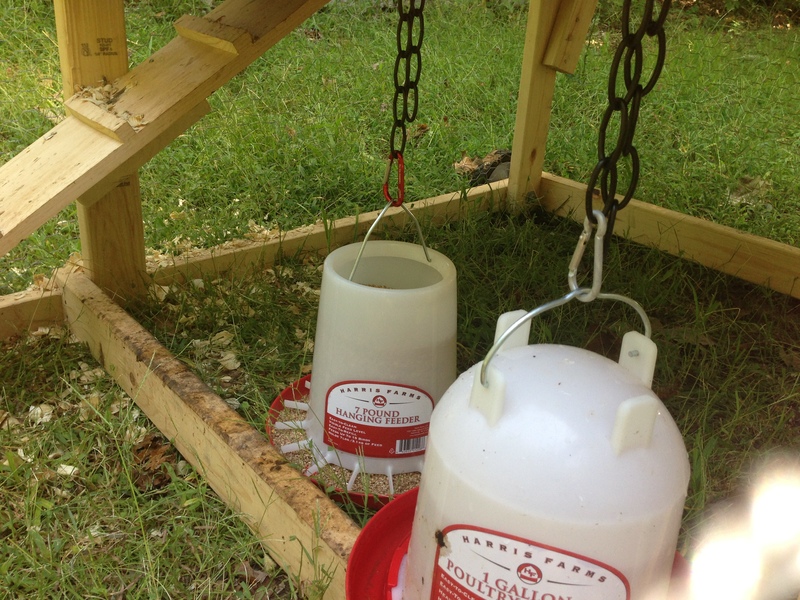 I also added some chains to the waterer and feeder so that I wouldn’t have to take them out to move the tractor, and also to try to get them to stop pooping in both. Because they do that constantly. 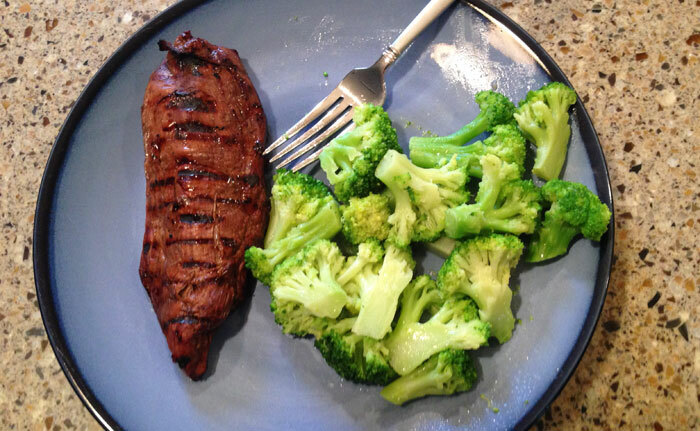 That can’t be healthy. Ah – not so creepy now. I said thanks and told the checkout guy “Flakes, please.” I definitely see how flakes are better now – especially because I’m still losing a lot of it through the hole by the ramp. I think I’m going to build a small ‘fence’ around it so that it won’t fall out so easily. Now that I’m a farmer I feel like I’m in a club. A club where, when I’m at Tractor Supply, random people – who are passionate about some of the same stuff – will gladly look awkward for a moment to help a brother out. Same for bee keepers… Every single one that I’ve talked to has been super excited to help out and show me anything I want to know. Reminds me of a simpler time, growing up in Cairo, Ky, when everybody considered you to be a neighbor even if you were a 20 minute bike ride away. Hopefully, I’ll have some awkward wisdom to give to someone at Tractor Supply before too long. 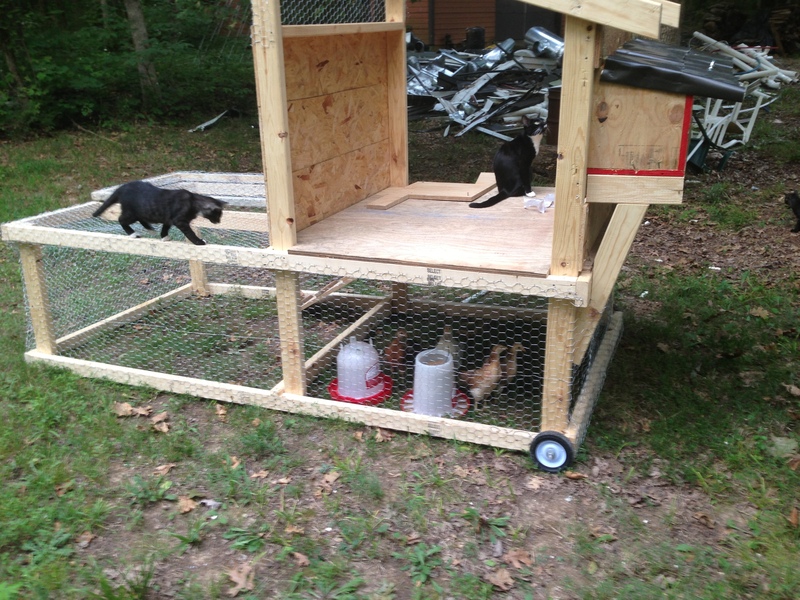 This entry was posted in Chickens and tagged building, chicken coop, chicken tractor, chickens, construction, homesteading, renovation on August 16, 2014 by David. When we first bought our house, we thought that we’d be done with renovations after about 3 months. We gave ourselves a 6 month timeline to pad our expectations a bit – that way if 3 months rolled around and we weren’t done we would still feel like things were moving smoothly. Well, three months went to getting permits from the county alone. That was frustrating. We just hit the six month mark, and we’re not quite done. We probably have a month (or two) left. That’s not as much frustrating as it is exhausting. For the last three months of renovation, I’ve tried to be at the house as much as possible. 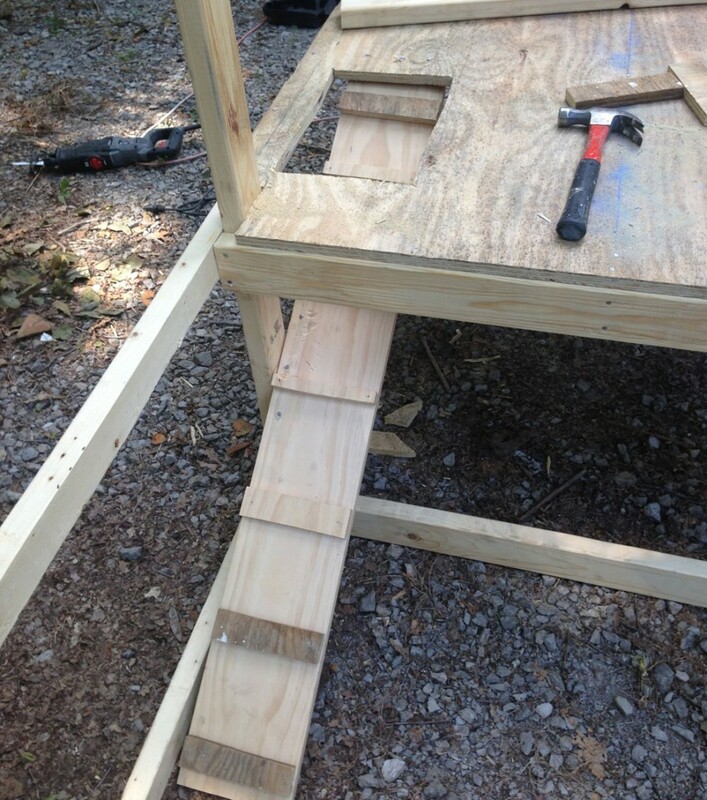 If our contractor, Alex (my uncle), was working, I wanted to be working along-side him if I could in order to save money. Because I’m a self-employed web developer, my schedule is whatever I’d like it to be, as long as I get everything done. So, on average I’d be at the house from 9ish-5ish; Alex would usually get there at 7 and leave at 3, so by the time I got there I’d jump in where they needed me, and I’d stay for a couple hours to clean up or complete any project that I could. That also means, after an almost eight-hour day, I’d come back “home” and pull out my laptop, working until midnight or later. I’m incredibly happy (when I’m not tired and grumpy) that I’ve been working at the house, though – I feel like I’ve picked up a billion skills that a web developer would not normally have. 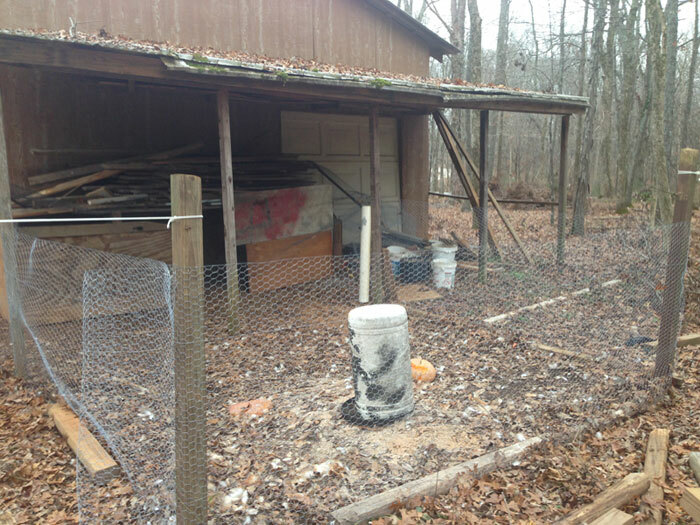 I’m excited to be able to apply these skills to building a chicken coop and other various things after we’re settled in. The funny thing about building/renovating a house is that none of it is magical. There are a lot of things in this world that seem like I’d never be able to do because there is some line between attainable and fantastic. Anything that I can do, or know that I could do, seems to me like a fairly average skill, and anything that I have no idea how is done is ridiculous. Building a house was one of those never-going-to-happen skills, because it’s so far out of my skillset that you must be a wizard to do it. Funny thing, though… When Alex would say “pull all of that drywall off” or “build that wall,” the curtain started to lift, and I could see the wizard moving the ropes. It was so very normal. Hard, but normal. I’m not huge on exercise, but I’ve had more exercise in the last 3 months that I’ve had possibly in my life. 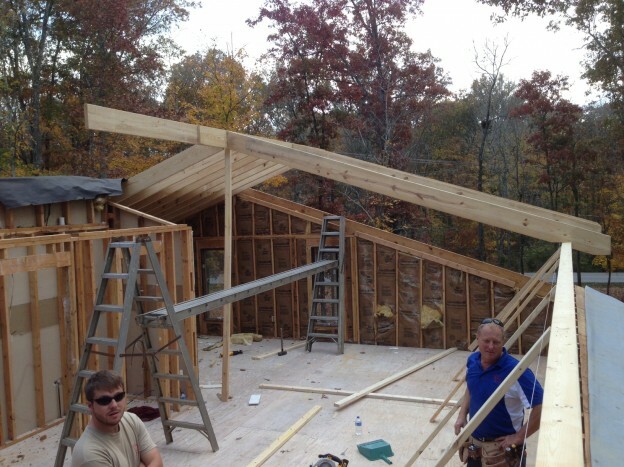 We’re at the point now where there house is completely framed, wired, and insulated, and we’re waiting on drywall. Unfortunately (or fortunately? ), I didn’t try my hand at wiring the electric or running the plumbing – though I did get to cut and put on temporary piping – so that’s still only slightly a mystery to me. 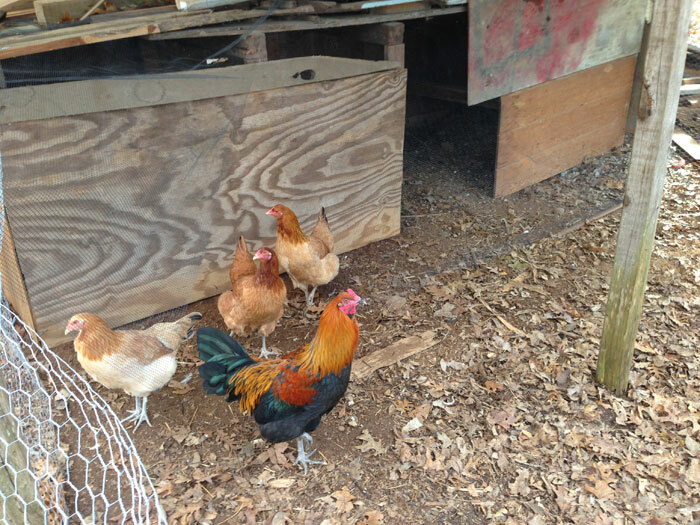 I don’t plan on running outlets so the chickens can watch Walking Dead, though, so I’m ok with that for now. 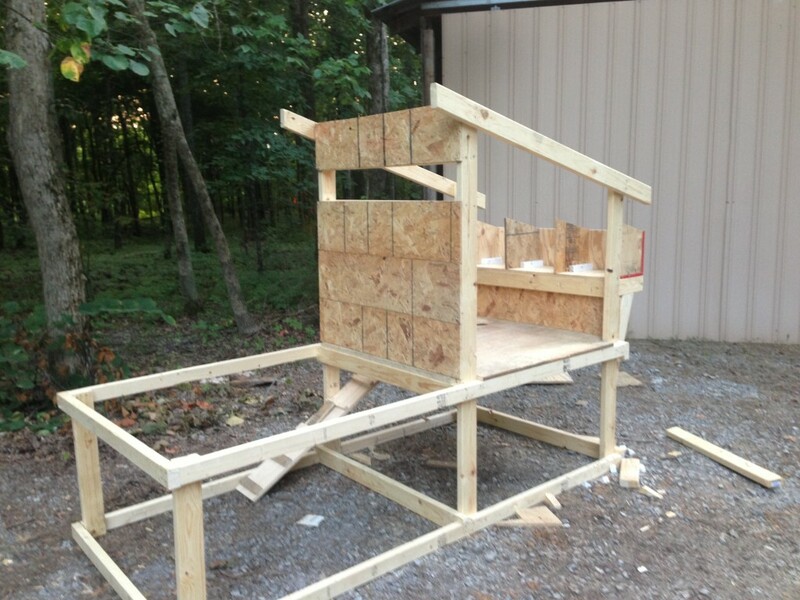 This entry was posted in Construction and tagged building, construction, renovation, skills on December 31, 2013 by David.